Books, paper, and words are all around our home. There are no televisions. My husband and I are both writers, and, more frequently than we probably want to admit, we hone our craft by reading the words of others. We ran out of bookshelf space last year, for the second time, and so we have a new pact: to slim down our collection of tattered covers. During my last bout of book sorting I unearthed 15 years of handwritten and illuminated journals that I’ve compiled and written since middle school. It’s quite a stack. Early books tell stories of teenage angst and short-lived high school crushes, with later ones tracking travel experiences and idea-building for potential stories, articles, books, or poems. Of course, finding the older journals distracted me from the task at hand, as I was curious to remember what mattered to me most decades ago. All journals, no matter who writes them, are fascinating to me in that they track the story of people. And those stories, more often than not, are written from the heart. Artist Dawn Patel and I built on this idea when we co-taught journaling classes in Bayfield, Wisconsin through the store she owned at the time, Inspire. She focused on the conceptual art techniques that are often used to “illuminate” the meaning and beauty of whatever is written in the journal entries, while I shared creative writing and pre-writing techniques to help the students’ writing be concise and focused. Both Dawn and I enjoyed these classes very much, as did the students. 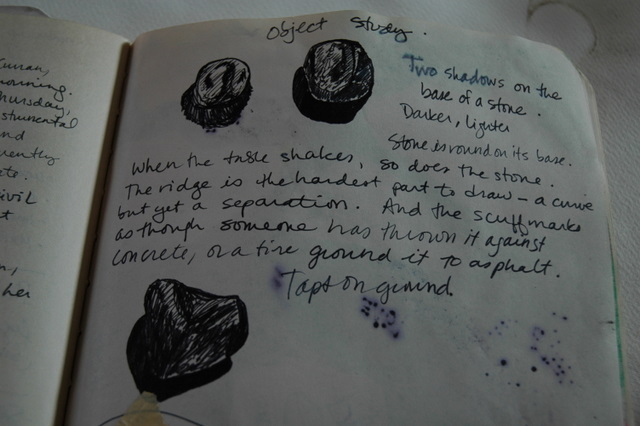 I’ve shared two entries from my own journals for purposes of illustrating what an “illuminated” journal looks like. Illumination was a technique long ago used by illustrators and calligraphers, who were often monks, in the hand-copying of texts before the advent of the printing press. The monks used pen and ink or other mediums to physically write out texts, while a codex of high esteem received special treatment, in that it would contain illustrations. Those illustrations are sometimes called “illuminations,” for they “illuminate,” or draw light on, the subject(s) of the text. Modern-day illuminated journalists still use illumination techniques in the journals they create. Some journalists track their travels through a combination of art and text, such as in this “Train to Portland” chronology. However it is done, originality, balance, and integration are key to archiving an understanding of whatever experience inspired the journal entry at the outset. 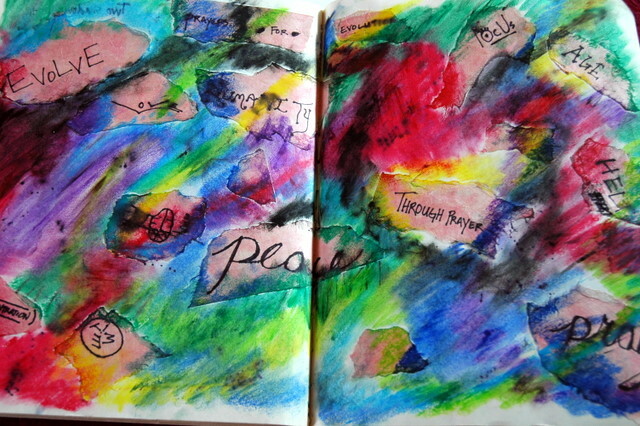 Illuminated journaling does not require artistic talent, nor does it require great writing ability. At the core, to keep a journal is to keep a record of one’s heart: what moves you, what inspires you, and what you never want to forget. I found this post inspiring. I keep journals and have for years, but I have been dragging a bit. I think adding art, illustrations, even scrapbook type mementos would spice it up and make it more interesting to even me. Thanks for the suggestions. You’re welcome, and best of luck as you delve into your own journaling! PreviousLet me show you how it’s done.